MovieSherlock - Mac YouTube downloader and converter. Movies youtube mac downloader. 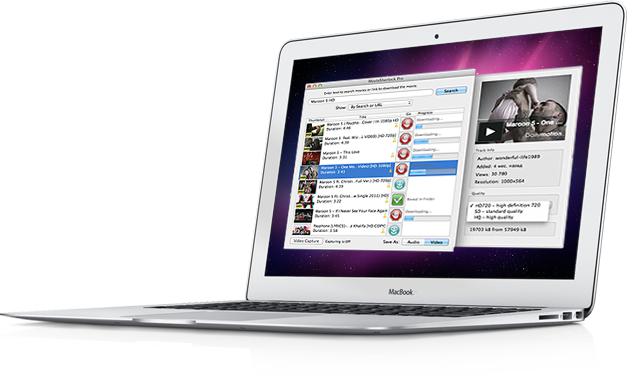 Easily download and convert YouTube movies to your Mac hard drive. You can download videos. We guarantee it. Choose video to download. We will do the rest! Download YouTube, DailyMotion, Vimeo and other online videos with a single click. HD and HQ videos, save as MP3 and MP4, capture video from the browser. Download online videos automatically. A fantastically easy to use application to save web videos playing in your browser. Save them in MP4 or MP3 format. The Free Trial version works as MovieSherlock Pro edition and allows you to download up to 4 videos.